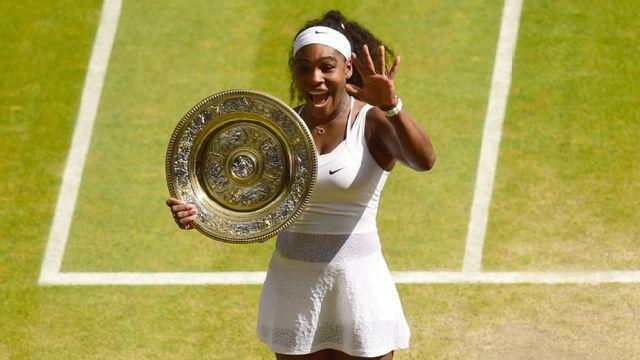 Serena Williams has defeated Garbine Muguruza to clinch the sixth Wimbledon win of her career. The hugely entertaining 123-minute match ended 6-4, 6-4. After her women’s singles final victory, Williams held the winner’s trophy, the Venus Rosewater Dish, high overhead as she beamed at her cheering fans. It was Muguruza’s first-ever Grand Slam final. Muguruza commented, “It’s hard to concentrate on a final because you have Serena in front of you. You’re thinking, she won five times this. You’re like, okay, every point, every point, don’t lose this point. But. I just learned that all the people are nervous, even Serena, in a final, because I saw it.” Muguruza beat Williams at the French Open 14 months ago.